Who Are You: School 2015 is the sixth installment in the Kdrama School series, and the main topic this time is bullying. Since that’s not really a compelling enough storyline to build a 16 hour Kdrama around, the writers turn the whole thing into a mystery to keep us hooked. Teenage romance and a fairly decent “who done it”… not a bad way to spend some drama time. Lee Eun-Bi is a sweet girl who lives in an orphanage with several other kids. Being the oldest, she takes care of them and they love and respect her like a real big sister. Go Eun-Byul is a strong, intelligent girl who lives with her loving adopted mother in a beautiful house. She’s a popular student who attends a very prestigious high school. Eun-Byul is aware of her younger twin sister, Eun-Bi, and watches over her from afar. However, Eun-Bi has no idea Eun-Byul even exists. One day, Eun-Bi comes to the aid of a friend who is being picked on and, because she is willing to stand up to the injustice, she instantly becomes the target of the lead bully at their all girls high school. She quietly endures the bullying until she is so desperate for it to stop she decides to put an end to it all by committing suicide. She is saved from drowning and when she wakes up in a hospital she has (surprise!) amnesia. A kind woman there calls her Go Eun-Byul, claims to be her mother and takes her home. Thinking she really is someone named Eun-Byul, and not knowing if her memory will ever return, she decides to resume what she now believes, and everyone else thinks, is her life. Her friends find her sweet, kind nature a refreshing change from the tough, slightly aloof personality of the Eun-Byul they knew before her “accident”. What will happen if Eun-Bi ever recovers her memory and realizes she has a whole different, difficult life somewhere else? Kim So-Hyun is fantastic playing the different personalities of both Eun-Bi and Eun-Byul. Although she’s only 16 years old she’s already quite a seasoned actress. She began her acting career at the young age of 7 and has already been in quite a few Kdramas. I’ve seen her in Que Sera Sera, I Can Hear Your Voice, and was especially impressed with her acting in Missing You and The Suspicious Housekeeper. Starting his career last year as a model and recurring actor in the 10 episode Kdrama The Idle Mermaid, Nam Ju-Hyuk tackles his first main role as the darling gold medal swimmer Ha Yi-An and does a wonderful job. His character is gentle and sympathetic, just the type of guy any high school aged girl would fall for. But he only has eyes for Eun-Byul, whom he’s loved for the past 10 years. Boy band BtoB member, Yook Sung-Jae is great as the school director’s son, Gong Tae-Kwang. It’s not surprising he struggles with depression – his father is the director of the school he attends yet no one knows it because the man won’t even acknowledge Tae-Kwang as his son; when he was young his parents divorced and he no longer has contact with his mother who is a famous actress; his father put him in the hospital saying he had psychological disorders just so he didn’t have to deal with him; and he doesn’t have any close friends. Tae-Kwang falls for Eun-Bi when she comes back to school as a kinder Eun-Byul. Kim Joon-Seok is the wonderful, handsome homeroom and math teacher played by Lee Pil-Mo. I loved him in Emergency Couple and Pinocchio and can’t wait for someone to finally realize his true potential and cast him as the male lead in a romantic comedy. Joon-Seok honestly cares about his students and loves his job, yet he has a secret that haunts him and makes him wonder whether or not he even has the right to be a teacher. Having acted in one made for TV movie, eight dramas, and 12 feature films, David Lee now plays Park Min-Joon, the class president who is under tremendous stress because his mother demands he be the best student in the class. Other than eating and sleeping, all Min-Joon is allowed to do is go to school and attend an illegal study group his mother is in charge of. Once he gets home he isolates himself in his room and studies all night. The girl you can’t help but hate is Kang So-Young played by Jo Soo-Hyang. This is her first Kdrama but I’m sure it won’t be her last. Since she is so good at acting bad, she just may have pigeon-holed herself into wicked character rolls. Underneath her counterfeit smile, So-Young seems to be just plain rotten. How and why can someone so young be so cruel? This school Kdrama is packed with trials teens all over the world are facing. Bullying, suicide, depression, adoption, divorce, school grades/scores, young love, friendship, disappointment, career goals, lying, emotional abuse, a broken heart… all topics addressed in a very realistic way. That sounds like a lot to make sense of but the writers meshed them together well in one entertaining drama. The soundtrack is nice and has three songs I especially like. My favorite is Reset. It’s the one played most frequently throughout the show. The first time I heard it I couldn’t help but wonder how many people might wish their life had a reset button. It’s always nice when one of the actors in the drama sings on the soundtrack. Such is the case with Yook Sung-Jae, who plays Gong Tae-Kwang, singing Love Song. I didn’t even know that was him until the drama was over. He sings beautifully, showing he doesn’t need the other BtoB guys to make him sound good. Also, Jonghyun and Taemin, from the Kpop group SHINee, sing a pretty song entitled That Name. There’s a lack of amazing scenery but they make up for it in the swimming races we get to watch. Having a pool as the setting for a couple scenes is a nice change from what Kdrama viewers are used to. Since I’ve been out of high school for awhile I can’t honestly tell you how realistic the writers were when it came to developing the lives of the teenage characters. 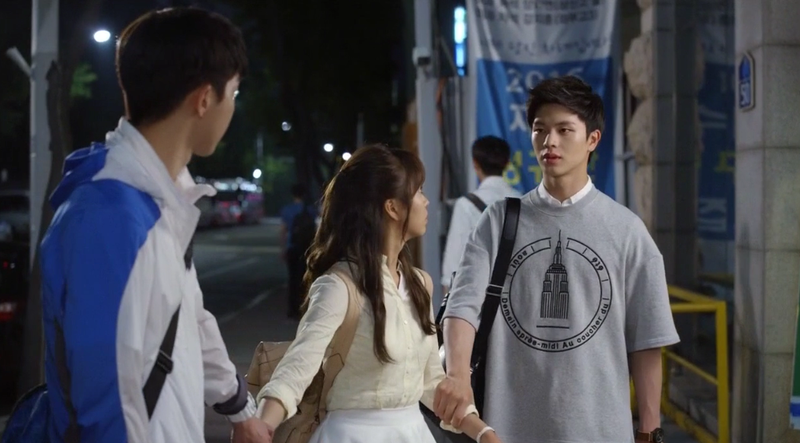 I can tell you, however, that Who Are You: School 2015 is an entertaining mystery and a show any high school age kid, parent of a teen, and educator would do well to watch.